You really have to feel for anyone who worked on Jane Got A Gun – not so much because of the final product, which we’ll get into shortly, but because of all the hell that went into actually making the damn thing. The Western had one of the most troubled productions in recent memory, so much so that it’s hard to even know where to start. Once the initial script by Brian Duffield was spotlighted as part of the 2011 Black List of the best unproduced screenplays (which, after Pan and Fathers and Daughters, we now take with a huge pinch of salt), it was picked up by Natalie Portman as a vehicle for her to produce as well as star, and soon not only were Michael Fassbender and Joel Edgerton cast in two lead respective hero and villain roles, but director Lynn Ramsay – coming off the success of her chilling adaptation of We Need To Talk About Kevin – was hired to take the helm. That, as they say, is when it all started to go wrong; Ramsay was fired from the film on the very first day of shooting, after she was allegedly a no-show on the set, and she was soon replaced by Warrior’s Gavin O’Connor, who also ordered rewrites on Duffield’s script to be done by Anthony Tambakis and Edgerton. However, Fassbender also balked on the project, and Edgerton was recast in Fassbender’s part while Jude Law was brought in to fill the villain’s shoes. But just when it couldn’t get more chaotic, Law left shortly after Ramsay was let go, and was replaced by Bradley Cooper – who ALSO left the part shortly after being cast, and was finally replaced by Ewan McGregor. With all that drama, it’s a miracle that the film actually finished filming, and it looked like its problems were finally over – but oh no; its original distributor, Relativity Films, underwent a bankruptcy phase last year, and with it came a brief period of the film being with neither a release date nor a distributor, before Lionsgate picked it up and released it in the dead season known as January in the US, opening to decidedly mixed reviews (it currently sits at 40% on Rotten Tomatoes) and a tepid box office performance. And yet, after all that hell, the film itself is just wildly mediocre. Not the absolute disaster many had feared, but certainly not the surprise gem some people might have been hoping for. All that trouble for something that turned out to be just “eh”. The film simply follows a woman named Jane (Portman) who sees her husband (Noah Emmerich) return home one day riddled with bullets, courtesy of the Bishop Boys gang and their leader John Bishop (McGregor), and after learning that they are heading towards her home to finish the job she turns to her former lover Dan Frost (Edgerton) for help. It’s a very basic set-up, and surprisingly conventional for something with all this weight on top of it, but it’s a little refreshing to see a Western made nowadays that is very easy to follow without bogging itself down with unnecessarily complicated villainous schemes or bloated running times (ahem, The Lone Ranger). However, those expecting a more feminist revision of the classic Western as the marketing and even the title seems to suggest will be sorely disappointed; Portman’s Jane is more just kind of there rather than an active force behind the plot, but aside from that she’s just not that interesting of a character. Any emotional moments between her and certain characters like her young daughter or her all-but-useless bed-ridden husband fall flat because there’s not much about her that’s worth getting invested in, and more often than not she plays more like a supporting character in the very movie that’s named after her. She doesn’t even have the biggest character arc in the film; that goes to Edgerton, who aside from being the very best part of the movie also plays the most complete character, the one who has the most interesting backstory and three-dimensional personality and motives, i.e. the exact things that Jane should have had, but were for some reason transplanted into her male co-star instead. It’s a problem, certainly, but even more distracting is Ewan McGregor as the lead villain, and we must say that if there ever was a more obvious victim of the behind-the-scenes woes, he would be it. He is a fine actor, but here he feels and acts exactly though as if he’s been given sloppy seconds by the numerous actors before him, and he has no idea what to really do with it. Never mind the fact that he’s also sporting an outrageously cartoonish moustache and soul patch, but he’s also delivering his lines as though he’s just learned them that very day on-set, which given the timeline during his casting that wouldn’t be so much of a surprise. It’s an awkwardly lost performance that tries and fails to be intimidating, and every time he appears on-screen you can just sense how confused he seems to be, playing this character he was never even originally considered for. He’s clearly trying to make the most out of it, but in the end he’s just horribly miscast. Problems in its final script, including an ending that seems like a cop-out in favour of a traditional Hollywood ending, also don’t help matters, even though O’Connor directs it well with some nice cinematography by Mandy Walker (ANOTHER last-minute replacement for another crew member), and the acting is (mostly) solid. However, for all it’s been through, it’s just a bit underwhelming that Jane Got A Gun is only okay, and will likely just pass into the realms of forgettable-ness rather than be remembered for the disaster it was shaping up to be. 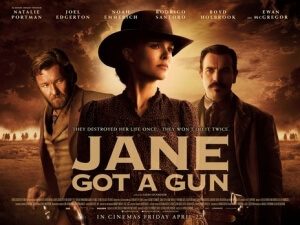 Jane Got A Gun lets its infamous production troubles overshadow the wildly mediocre film itself, and while it’s well-made it also suffers from a script that fails to capitalise on its potential for a more feminist Western and instead opts for a more traditional film of the genre, as well as a miscast Ewan McGregor as the distractingly cartoonish villain who is never as intimidating as the film thinks he is.